Purchase a long-term video rental to support your studies in Soul Astrology. After purchase you will have unlimited access to the video for 60 days. If you have Aries Rising you are an Aries Soul and you are here to inspire others with Divine ideas. Your challenge is to tame your mind, cultivate your intuition and cultivate self-awareness to the point where you can distinguish Divine inspiration from the needs and drives of your own personality. 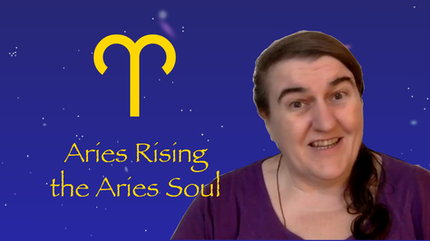 Based on "Esoteric Astrology" by Alice Bailey, Soul Astrologer Ruth Hadikin explains the higher purpose, potential pitfalls, and what you are learning on your spiritual journey as an Aries Soul. In this video you will learn about the fear-based personality expressions and the highest Soul Centered expressions of this inspiring sign, and why you experience some of the challenges that you do in this lifetime. 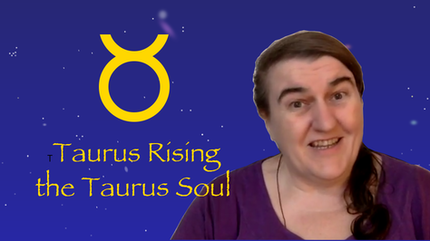 If you have Taurus Rising you are a Taurus Soul and you are here to release personal attachment and develop your senses for their highest purpose: to realise peace, illumination and eventually enlightenment. Because Taurus resonates strongly with peace, you tend to relax once you have all your creature comforts around you. Your biggest challenge is to not become complacent, and stay awake! Based on "Esoteric Astrology" by Alice Bailey, Soul Astrologer Ruth Hadikin explains the higher purpose, potential pitfalls, and what you are learning on your spiritual journey as a Taurus Soul. In this video you will learn about the fear-based personality expressions and the highest Soul Centered expressions of this peaceful sign, and why you experience some of the challenges that you do in this lifetime. If you have Gemini Rising you are a Gemini Soul and you are here to teach right human relations. To do this you have to 'marry' the head-mind and the heart-mind and deeply understand relationship as the interplay of light. Because Gemini is so curious you are interested in everything, so your biggest challenge is to stay focused on your soul path and not become distracted by mundane affairs. Based on "Esoteric Astrology" by Alice Bailey, Soul Astrologer Ruth Hadikin explains the higher purpose, potential pitfalls, and what you are learning on your spiritual journey as a Gemini Soul. In this video you will learn about the fear-based personality expressions and the highest Soul Centered expressions of this brilliant sign, and why you experience some of the challenges that you do in this lifetime. If you have Cancer Rising you are a Cancer Soul and you are here to find your inner light, keep it lit, and flow greater degrees of compassion into the world. Because Cancer is the sign of mass consciousness, you feel the fear of the masses. The biggest challenge for you is not succumbing to fear but to allow it to move through you and become transmuted into compassion. Based on "Esoteric Astrology" by Alice Bailey, Soul Astrologer Ruth Hadikin explains the higher purpose, potential pitfalls, and what you are learning on your spiritual journey as a Cancer Soul. In this video you will learn about the fear-based personality expressions and the highest Soul Centered expressions of this compassionate sign, and why you experience some of the challenges that you do in this lifetime. 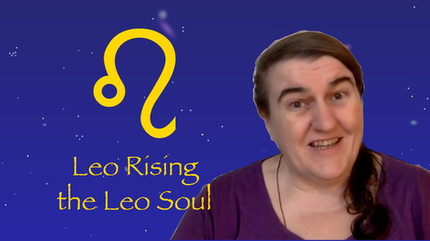 If you have Leo Rising you are a Leo Soul and you are here to usher in an era of heart-centered leadership. Your biggest challenge will be to not become identified with your actions. You are NOT what you do. There is a real self, and a false self, and it is your job to figure out which is which. Once you do this you align with your soul purpose and your life becomes an expression of Divine Will. Based on "Esoteric Astrology" by Alice Bailey, Soul Astrologer Ruth Hadikin explains the higher purpose, potential pitfalls, and what you are learning on your spiritual journey as a Leo Soul. In this video you will learn about the fear-based personality expressions and the highest Soul Centered expressions of this creative sign, and why you experience some of the challenges that you do in this lifetime. If you have Virgo Rising you are a Virgo Soul and you are here to be of service by flowing pure Divine love into the world through your work. Your biggest challenge is to not become discouraged and disheartened by the imperfection of the mundane world, which could leave you feeling anxious and critical. The perfection you seek is the perfection of the soul. Let go of ideas of how things 'ought to be' and flow your love anyway. 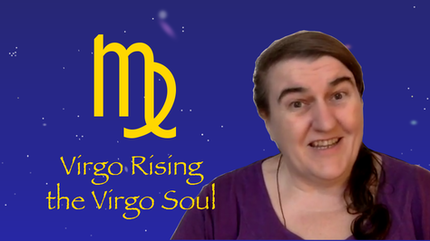 Based on "Esoteric Astrology" by Alice Bailey, Soul Astrologer Ruth Hadikin explains the higher purpose, potential pitfalls, and what you are learning on your spiritual journey as a Virgo Soul. In this video you will learn about the fear-based personality expressions and the highest Soul Centered expressions of this holistic sign, and why you experience some of the challenges that you do in this lifetime. 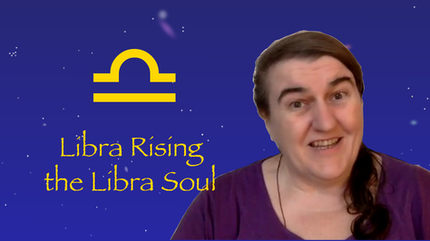 If you have Libra Rising you are a Libra Soul and you are here to bring in greater degrees of harmony and balance into the world through right relationship. In your case this comes from a deep understanding of the relationship between all things: including people and the beautiful planet we live on. Your biggest challenge is finding the balance between self and other in your own relationship. You matter as much as others. Not more, not less. Finding the point of balance which honors both is part of your life's work. Based on "Esoteric Astrology" by Alice Bailey, Soul Astrologer Ruth Hadikin explains the higher purpose, potential pitfalls, and what you are learning on your spiritual journey as a Libra Soul. In this video you will learn about the fear-based personality expressions and the highest Soul Centered expressions of this harmonious sign, and why you experience some of the challenges that you do in this lifetime. If you have Scorpio Rising you are a Scorpio Soul and you are here to transform darkness into light through your own personal journey of transformation. You are learning about energy and how to flow energy in ways that are beneficial to all concerned. It often feels like your life is one big struggle, but it is a struggle which makes you stronger, and comes at the appropriate time. Like a chick pecking it's way out of an egg, it's time now to hatch. Your biggest challenge is to not get caught in confrontation but to transmute the energy of any potentially volatile situation, which transforms you and lifts you to your highest potential. 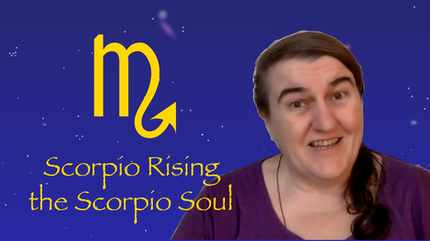 Based on "Esoteric Astrology" by Alice Bailey, Soul Astrologer Ruth Hadikin explains the higher purpose and potential pitfalls of your spiritual journey as a Scorpio Soul. In this video you will learn about the fear-based personality expressions and the highest Soul Centered purpose of this powerful sign, and understand why (as a Spiritual Warrior) you have some of the challenges that you have experienced in this lifetime. 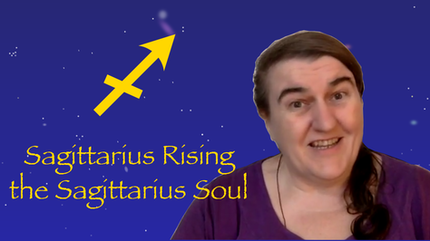 If you have Sagittarius Rising you are a Sagittarius Soul and you are here to uplift humanity through the revelation of truth and wisdom. To do this you have to know truth for yourself, the deeper spiritual truth that lies beyond mind and mental concepts. Since Sagittarius is the sign of the philosopher you love to think and formulate philosophies to guide your way of living. Your biggest challenge is to release all man-made mental concepts, go beyond opinions and philosophy, and discover the underlying truth of your existence. Based on "Esoteric Astrology" by Alice Bailey, Soul Astrologer Ruth Hadikin explains the higher purpose, potential pitfalls, and what you are learning on your spiritual journey as a Sagittarius Soul. In this video you will learn about the fear-based personality expressions and the highest Soul Centered expressions of this soul-searching sign, and why you experience some of the challenges that you do in this lifetime. If you have Capricorn Rising you are a Capricorn Soul and you are here to manifest heaven on Earth by expressing your vocation for the greater good. 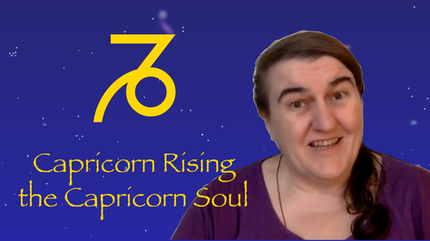 Based on "Esoteric Astrology" by Alice Bailey, Soul Astrologer Ruth Hadikin explains the higher purpose, potential pitfalls, and what you are learning on your spiritual journey as a Capricorn Soul. Your 'vocation' is your spiritual calling. You are here to listen to that spiritual calling and make the sacred manifest in the world. At the highest level the Capricorn soul is an engineer of light, you have an innate knowing of alchemy and how to manifest heaven on Earth. Your biggest challenge is to use your talent and energy for spiritual purposes: to aspire to spiritual heights rather than becoming lost in the trappings of worldly wealth and achievement. In this video you will learn about the fear-based personality expressions and the highest Soul Centered expressions of this deeply mysterious sign, and why you experience some of the challenges that you do in this lifetime. 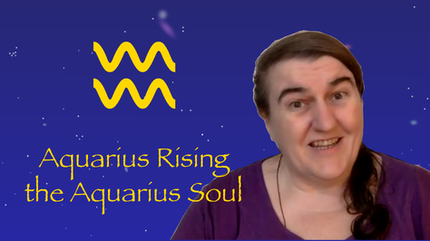 If you have Aquarius Rising you are an Aquarian Soul and you are here to flow the dual waters of love and life into the world in ways that benefit humanity. Based on "Esoteric Astrology" by Alice Bailey, Soul Astrologer Ruth Hadikin explains the higher purpose, potential pitfalls, and what you are learning on your spiritual journey as an Aquarian Soul. Your biggest challenge will be to get out of your head and into your heart. The spiritual energy of which we speak flows through the heart and, as the fixed air sign, Aquarius is very much a sign of the mind. It is too easy for you to be lost in ideas. When you access the power of your heart you will use your mind as the vessel, the vase of Aquarius, through which you steadily direct the love and light that flows from your heart. In this video you will learn about the fear-based personality expressions and the highest Soul Centered expressions of this humanitarian sign, and why you experience some of the challenges that you do in this lifetime. If you have Pisces Rising you are a Pisces Soul and you are here to flow universal love into the world. 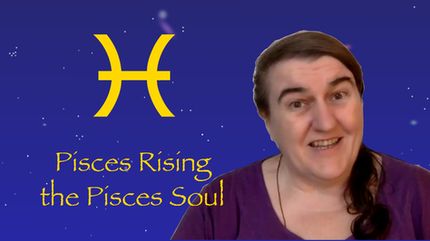 Based on "Esoteric Astrology" by Alice Bailey, Soul Astrologer Ruth Hadikin explains the higher purpose, potential pitfalls, and what you are learning on your spiritual journey as a Pisces Soul. The biggest challenge for you is to create appropriate boundaries, and not take things personally. Because you can feel what others feel, it is easy for you to take on other people's feelings. It is important for you to realise that everything you feel isn't yours, and that other people are responsible for their own feelings. Allow others to learn their own lessons, and stay in the place of love. 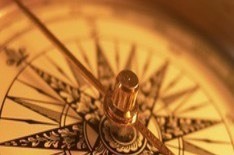 This way you become a 'spiritual pacemaker', striking a heart-tone that others can follow. In this video you will learn about the fear-based personality expressions and the highest Soul Centered expressions of this beautiful sign, and why you experience some of the challenges that you do in this lifetime. Find out more about your Soul Sign and Life Purpose in a personal Soul Path Reading from Ruth!